The Centerville-Washington Park District is now accepting applications for part-time, seasonal employment! 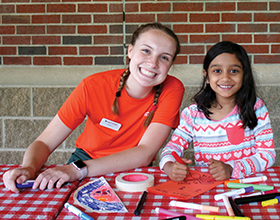 Summer program staff can work at Hidden Meadows Day Camp, Sugar Valley Camp, at the Summer Recreation Program or as summer naturalists. All program staff must be enthusiastic about working with children, enjoy the outdoors, and be willing to make an 11-week commitment beginning the last week of May. Applicants must be at least 16 years old. Positions for applicants under age 18 are limited. Seasonal operations staff assist with the day-to-day maintenance of 50 parks. Work includes mowing, trimming, painting, athletic field preparation, nature trail improvement, park clean-up, vehicle/equipment maintenance and building maintenance. Hours may include weekends and evenings. Second shift openings are available. Operations staff must be 18 or older and insurable to drive Park District vehicles. All applicants must pass a background screening.